The signing deadline for the 2014 draft has come and gone, and Boston's class has been finalized. In all, the Red Sox signed 31 of their 41 draft picks, including all of the top 21, and many experts have stated that the Red Sox got great value. Based on available bonuses, the Red Sox spent $6,504,300 on the 2014 draft, which is $131,000 over their $6,373,300 bonus pool. Because they went two percent over their pool, they will need to pay tax on the $131,000, but will not lose any future draft picks. Below is a breakdown of the draft, with some background on the bigger names that Boston signed. Be sure to check out our Draft History page for a list of everyone drafted by the Red Sox. Josh Ockimey - $450,000 ($167,200 over slot). The Red Sox took Ockimey in the fifth round, gambling on the first baseman's offensive potential which includes solid bat speed and plus power potential. The 18-year-old from Philadelphia impressed the Red Sox in his pre-draft workout, where he hit several home runs to right field, including one that went 420-feet. Kevin Steen - $255,000 ($112,400 over slot). A pure upside pick, the Red Sox took Steen in the ninth round, signing him away from his commitment to play baseball at Tennessee. The Red Sox have had good luck with Tennessee commits, with Casey Kelly and Mookie Betts both spurning the Volunteers for the Red Sox. Steen is a projectable right-hander with a loose arm and the ability to spin a breaking ball, but is very raw on the mound as he was a two-sport athlete in high school. Now focused solely on pitching, the Red Sox hope Steen can tap into his potential and progress on the mound. Trenton Kemp - $250,000 ($150,000 over slot). A very athletic, yet very raw center fielder, Kemp has all the physical tools you look for in a draftee. He has plus speed, a strong arm, and a projectable body that will add strength as he matures. His baseball skills lag behind his physical tools, and he will likely be a long-term project, but he is not someone that fans should write-off if he struggles early in his career. Devon Fisher - $300,000 ($200,000 over slot). The University of Virginia commit was one of the top defensive catchers in the draft, thanks to a plus arm and good receiving and blocking skills. While he projects to stick behind the plate, his bat has been knocked by evaluators, as they question how much contact he will make. But his defense will be his calling card, and if it is as good as advertised, he will not need an impact bat to contribute. Michael Chavis - $1,870,500. One could argue that Chavis had the best hit tool in the draft. Baseball Prospectus recently listed him as a name to watch for their Top 101 prospect list this winter, praising his bat by saying his "top-shelf feel for the barrel produces hard contact and surprising pop". The 18-year-old is currently playing shortstop in the Gulf Coast League, but it is expected that the 26th overall pick will move to third base or second base down the road. Michael Kopech - $1,500,000 ($178,000 under slot). Kopech, who Boston took with the 33rd overall pick, has some of the best present stuff the Red Sox have drafted in recent years, with a fastball that touches 98 and a slider that has shown plus. His mechanics are difficult to repeat, which leads to inconsisent command and control, so there may be some growing pains as the Red Sox try to straighten those out. He is a high-upside pick with some risk, but he immediately becomes one of the most exciting players in the lower levels of the system. 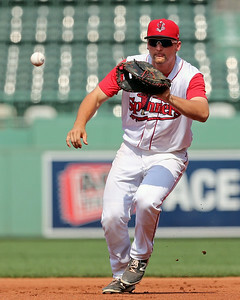 Sam Travis (pictured, above) - $846,800. A second-round pick, Travis shined at Indiana University, where his OPS did not dip below .900 in any of his three seasons with the Hoosiers. Travis, 20, has already tallied 111 at-bats with Lowell, hitting .297/.333/.405 with three home runs. Reports have been mixed on the first baseman so far, as his swing has been inconsistent, but scouts have liked his mature approach and feel for the strike zone. Some other slot or near-slot signings include Jake Cosart, who is new to pitching but has touched the high-90s with his fastball, Danny Mars, who is hitting .386/.463/.557 for the Spinners, Ben Moore, who is transitioning to catcher after playing mostly outfield at the University of Alabama, and Karsten Whitson, a former first-round pick who has battled several injuries during his time as a Florida Gator. Jalen Beeks, Chandler Shepherd, Jordan Procyshen, Michael Gunn, Jeremy Rivera, Jordan Betts, Tyler Hill, Derek Miller, Cisco Tellez, Ryan Harris, Taylor Nunez, Josh Pennington, Alex McKeon, Kuehl McEachern, Hector Lorenzana, Brandon Show, and Joe Winterburn.